COMMUNITYPROFILES | COMMUNITY PROFILES IS A WEEKLY SERIES THAT APPEARS EACH MONDAY AND DELVES INTO THE PEOPLE WHO LIVE, WORK AND PLAY IN SANTA MONICA. Jason Kozma is one of the rare people who realized his passion early in life and then capitalized on it. After building a successful business as a personal trainer, Kozma started building his physique. The hard work paid off — the 34-year-old was named “Mr. America” last month. This year’s Mr. America contest was held on Oct. 23 in Santa Clara, Calif. Last year was the first year that the contest had regained status after several years of relative obscurity. Once considered the Oscars of bodybuilding, the contest dates back to the 1930s. A loss of sponsorship was responsible for the lull. But the 80 competitors in this year’s show was a significant jump from last year’s 30, and it looks to be on the rise again. Kozma became interested in bodybuilding at age 12 when his brother competed in his first show. At 16 years old, he entered his first competition, going on to win the novice and teenage divisions at the Tennessee state level. Soon, college life overtook his competition schedule as he worked to finish his degree in business administration at Tennessee Middle State University. It was 12 years before Kozma would compete in a bodybuilding competition again. The life of a successful bodybuilder is characterized by inviolable self-discipline. Every morsel of food is analyzed for fat, carbohydrate, protein and calorie content. Kozma lifts weights six days a week, whether he is training for a competition or not. Off season, Kozma eats between 4,000 to 5,000 calories a day. Prior to a contest, he cuts back to 2,500 to 3,000 calories, and reduces his fat intake drastically. 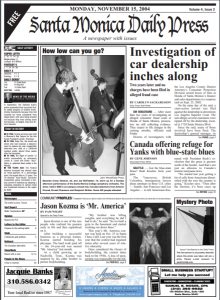 Going into the Mr. America contest, Kozma’s body-fat content was 1.8 percent. “That’s an incredibly unhealthy amount of body fat,” he said. “You wouldn’t want to be walking around like that for long … your organs would probably fail.” But becoming a personal trainer was still an integral part of Kozma’s plan. It would allow him to perfect the art of physical fitness while helping other people attain their fitness goals. Kozma spoke to the Daily Press about what led him to his Mr. America victory and about his life as a personal trainer. After being off for 12 years, what made you enter this contest? What got you back into the bodybuilding? What was your training regimen like leading up to the Mr. America contest? What possesses you to do this? “I do it because I love it, and I’m good at it. And because it gives me something to train for, a goal to strive for, which is why I started doing it again. Did you know you wanted to be a personal trainer and a bodybuilder since you were a kid? If you didn’t do this, what else would you do? Since your life is so regimented, do you ever just eat whatever you want? “No, there’s always a voice in the back of my head. Like, for instance, I can’t eat fettuccini alfredo because I’m like, where’s the protein? And it’s all fat. It does limit the foods that I allow myself to eat. Sometimes I think, ahh maybe I’ll go splurge, but then when I go someplace and I’m looking at the menu, I’m looking for the item with the highest amount of protein and the lowest carbs and fat. I just automatically do that. Because if I eat the crap that doesn’t fit my criteria, then I feel bad about it. I’ve been like that ever since I started competing because that’s when I really started to learn about diet. And I became aware that it made a difference. How do you know what to do with each client? “I do what they need. I train them the way they need to be trained. And I know pretty much every way that you can do strength training and weight training. I don’t have to study in my free time to do it. It’s all in my frontal lobe. I train them three days a week, I have them do cardio for six days a week, and I have them go on a diet that I create for them … I start them on the real thing right away because they need to get results. People lose motivation if they don’t get results quickly. “It’s a lifestyle change. For a successful change in body composition, you have to change your lifestyle. And some people, regardless of what you tell them, they think it’s a temporary project. I’m going to do this for eight weeks and then … but their lifestyle is incompatible with having a great body. Do you ever binge eat or drink? What was the night before the contest like? That’s surprising since it’s your first competition at that level. What could go wrong in the final days before a contest? How are you different from other trainers? What would you generally tell people about working out every week? What kind of cardio do you do? What are your favorite and least favorite things about living in Santa Monica? Education: Degree in business administration, Tennessee Middle State University. Certified personal trainer and nutritionist. 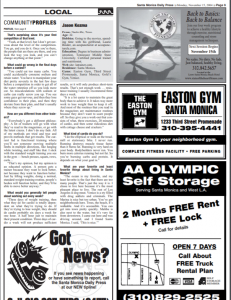 Gyms: Easton Gym, Third Street Promenade, Santa Monica; Gold’s Gym, Venice.